Although he was a four-time All-Star with the Boston Braves and respected throughout baseball as an excellent defensive catcher and steady hitter, Phil Masi is best remembered for being part of one of the most controversial plays in World Series history. During the bottom of the eighth inning in Game One of the 1948 Series between the Braves and Cleveland Indians, Cleveland pitcher Bob Feller spun around and threw to shortstop Lou Boudreau to try to pick Masi off of second base. Masi, who was pinch-running for slow-footed starting receiver Bill Salkeld, slid back to the bag and was called safe by umpire Bill Stewart, though most observers believed he was out. The implications became huge moments later when Masi scored the only run of the game on Tommy Holmes’ single, thus denying Hall of Famer Feller his best chance to win a World Series contest. Ironically, the decisive run that Masi accounted for in Game One would be the only one he scored in that World Series. Interestingly, and long since forgotten, is that Indians pitcher Bob Lemon and Boudreau picked Boston’s Earl Torgeson off of second base in Game Two using the same play. Cleveland won that game 4-1, and after the Indians captured the series it would have been logical for fervor over the incident to die down. “Lou tagged Masi out by two feet,” Feller went on. “It wasn’t even close. Everybody in the ballpark saw Masi was out -- except one -- the umpire. We hadn’t just picked off Masi. We had picked off Stewart too.” Feller added that “the pictures in the paper the next day left no doubt” that Masi was out, although others were of course far less conclusive. Feller said that Boudreau was thwarted in his attempt to inform the umpires that the team might use the pickoff play, which they had perfected during the season: “Lou told me later that he couldn’t alert the National League umpires to the play because [Braves manager Billy] Southworth was in the room during the pre-Series meeting of the managers with the Commissioner. Lou said he should have pulled them aside after the meeting but he didn’t and they didn’t know to be looking for it in a situation like that. Raymond R. Coffey of the Chicago Sun-Times on April 5, 1990 noted that “Phil had refused to talk about the play while Stewart was still alive. But, he admitted now, he was out; the ump blew the call.” Masi also acknowledged in his will that he was out, no doubt hoping to put an end to the topic as well as ease his conscience. It may have done the latter, but more than a decade later Feller was still hearing -- and talking -- about it. As a 20-year-old in his first professional season, Masi hit .334 with 10 home runs and 61 RBIs in only 96 games for Class “D” Wausau. In fact, he hit a home run in his first professional contest, and before the end of the 1936 season the hot young hitter was loaned as part of a “gentleman’s agreement” to the Eau Claire team, which Mostil managed. Although he had started as a catcher, Masi was a fulltime utility player during his second season with Wausau in 1937. He appeared in 12 games at first base, 20 games at third base, 36 games as a catcher, and 52 games as an outfielder. Wherever he played, he hit, including three home runs and a double in one contest. All told Masi had his finest minor league season at the plate in ’37, batting .326 and leading the league with 31 home runs in being named a Northern League All-Star. Following his 102-RBI performance with Wausau, Masi was purchased by the Milwaukee Brewers, a Cleveland affiliate, and sent to Springfield of the Mid-Atlantic League at the very end of the ’37 season. He would get into 12 games there and drive in nine more runs, giving him a fantastic 111 RBIs in just 124 contests that summer. 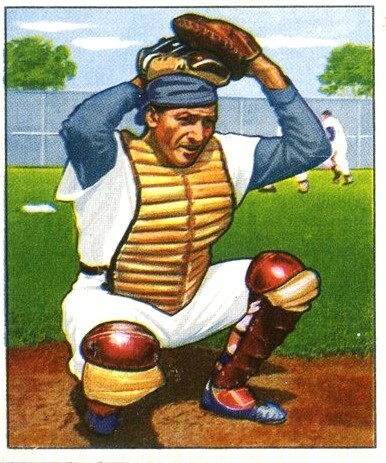 By 1938, Masi was primarily a catcher. During that season his backup behind the plate was Jim Hegan, who would be the opposing catcher when Masi’s Braves and his Indians faced each other in the World Series 10 years later. Hegan would eventually have the longer big league career, but in ’38 Masi was the star. While his offensive numbers had fallen a bit for Springfield, Phil’s .308 batting average with 16 home runs and 97 RBIs was enough to convince the Boston Bees (as the Braves were then called) to sign him to a deal. Boston scout Jack O’Connor had his eye on Masi when he became a free agent, and Jack McAllister, another scout for the team, soon offered Masi a contract with the Boston organization. The deal also included a signing bonus. The Bees already had a surplus of catchers: the ’38 Boston roster included veterans Al Lopez, Ray Mueller, and Johnny Riddle. This was tough competition indeed. Lopez was a future Hall of Famer, and Mueller a future All-Star. Masi, however, would not be deterred from the challenge, and Bees Manager Casey Stengel noticed. A New York Times article from March 10, 1939 recounted a conversation at the Bees’ training site in Bradenton, Florida between Fresco Thompson, the manager of the Bees’ Hartford farm team, and Stengel. “I’ll take a chance on that fellow [Masi],” said Thompson. After watching Masi hit a home run, Stengel retorted To Thomson: “You’re very generous. But maybe I’ll take a chance on him myself.” By the start of the ’39 season both Mueller and Riddle had been traded, and rookie Masi was the primary backup to Lopez. For a while, things did not get much better. From 1940 through 1942 Masi struggled woefully at the plate as a back-up player, posting batting averages of .196, .222, and .218, respectively and never getting more than 180 at-bats in a season. According to Rumill, Stengel used to get “a bit impatient” with Masi “because the kid eventually got so confused at bat, he didn’t know whether he was going or coming.” Still, the author noted that Stengel’s tips helped Masi develop as a hitter while first Ray Berres (in ’40 and ’41) and then Hall of Famer Ernie Lombardi (in ’42) handled the bulk of the catching duties. And although his offensive highlights were few during this period, Masi in 1941 did break up Whitlow Wyatt’s no-hit bid for Brooklyn in 1941 as a pinch-hitter with one-out in the ninth inning. Masi served as a backup through 1942, but that season ended prematurely for him on August 20 when he suffered a compound fracture of the little finger on his throwing hand and returned home to Chicago to recover. By this time it was already a lost year for Phil anyway; on July 25, his father Andrew Masi had died of a heart attack at age 53. Because Phil then became his mother’s sole means of support, he was exempt from military service. This meant he could stay on the Braves roster through World War II, and his patience would finally pay off the next season. When defending NL batting champ Lombardi was traded to the Giants in early 1943, Masi took over as the team’s regular catcher and responded with a .273 batting average in 80 games. He also showed good speed for a catcher, stealing seven bases during that summer. In fact, Masi occasionally was used as a pinch runner throughout his career in Boston, a rarity for a catcher. Still, it was the 5’10”, 180 lb. Masi’s ability to handle pitchers, rather than his bat, that kept him in Boston’s lineup consistently for the next several years. He made just two errors during the ’43 season, and tied Lopez (now with Pittsburgh) for the league’s top fielding percentage of .991. A 1978 Baseball Digest article made reference to his “magnet glove” and how he led the National League in fielding in 1947, 1948, and 1950, while also leading all N.L. catchers in assists in 1945 and putouts in 1946. For others, however, Phil’s numbers in 1947 stood out. Masi had career highs with a .304 batting average, which ranked 10th in the National League, 125 hits, and nine home runs. He also struck out just 27 times in 411 at-bats and had 11 sacrifice hits, so even when he wasn’t getting a hit, he was usually putting the ball in play (often to the team’s benefit). As Coffey said in reference to Masi’s 1947 season: “That wouldn’t get a guy into the Hall of Fame, which no one understood better than Phil. But it was pretty good.” During that summer, Masi also was the catcher when Jackie Robinson had his first at-bat in the major leagues (against Johnny Sain). Early in the 1949 season, there was a published report of “dissension” in the Braves clubhouse. According to a United Press article datelined April 13, 1949, Manager Southworth claimed that he had originally called a meeting to discuss signals but that stories were soon written about clubhouse turmoil. One allegation was that the players felt that Southworth was taking too much credit for the team’s accomplishments, and there were rumors that the club had called a players-only meeting. “I can’t understand why all this stuff is coming out,” said Southworth. Amid this mess, at age 33, Masi’s offensive production continued to fall in early 1949. Through his first 37 games, the veteran catcher was batting only .210 with zero home runs and six RBIs. With promising 19-year-old Del Crandall available as a potential replacement, the Braves traded Masi to the Pittsburgh Pirates for outfielder Ed Sauer on June 15, 1949. Masi would back up Clyde McCullough and Ed FitzGerald in Pittsburgh for the rest of that season, and to his credit hit much better (.274 in 48 games) after the trade. This showed other teams he could still produce, and on February 9, 1950, he was purchased from the Pirates by the Chicago White Sox in what was described in one account as “being a cash deal involving more than $10,000.” The Chicago native was going home. Playing in the American League for the first time and starting again at catcher, Masi’s career was further rejuvenated with the struggling White Sox in 1950. Following a stretch from June 11 to 25 when Chicago won 11 of 14 games, an anonymous major league manager commented: “I’m glad to join the applause for [newly-acquired Chicago players Ray] Scarborough, [Ed] Robinson, and the others, but don’t forget the guy who has been the biggest single factor in making the White Sox a tough club -- Phil Masi, the catcher. How that guy was ever waived out of the National league (sic), I’ll never know. All told, Masi hit .279 with the White Sox in 1950 and placed fourth on the club in both home runs (with seven) and RBIs (55). He was Chicago’s starting catcher again in 1951, but while he still hit well at .271 he was being rested much more. Following that season, when the team acquired the much younger Sherm Lollar in a trade with the St. Louis Browns, Masi became a backup once again. Phil’s career had come full circle by 1952. At age 36 he hit .254, the same average as his rookie season with Boston back in ’39, and at year’s end he was released by Chicago. Masi finished his major league career with 917 hits, 27 home runs, 417 runs batted in, 45 stolen bases, and a .264 batting average in 1,229 at-bats over 14 seasons. According to his obituary, Masi worked with a silkscreen printing firm in Chicago called Reliable Printing Company until 1980. Masi and his wife, Lucille (Gentile), had moved to Mount Prospect, Illinois in 1966, where he lived for the rest of his life. He had a daughter, Joanne Dhein, who also lived in Mount Prospect at the time of Phil’s death. Masi had seven grandchildren and six great-grandchildren. Phil Masi died of cancer on March 29, 1990 at age 74 at his Mount Prospect, Illinois home. His funeral mass was held two days later at St. Cecilia Church. Masi is buried in All Saints Cemetery in Des Plaines, Illinois. He is fondly remembered in Des Plaines as far more than just the guy who should have been called out at second base. After all these years, it’s only fair. Masi’s biography and statistics on baseball-reference.com, retrosheet.org, baseball-almanac.com, and baseballlibrary.com. Ahrens, Art, “Major League Baseball in the 1940s: Phil Masi recalls when the Boston Braves won a pennant almost 30 years ago,” Baseball Digest, February 1978, pp. 50-56. “Bees Defeat Giants. 4-3. as Hub Falters,” September 8, 1939. Coffey, Raymond R., “A ballplayer we shouldn’t forget,” Chicago Sun-Times, April 5, 1990. Cooke, Robert B., “Boston Triumphs 13-6 and 8-2, Piling Up 17 Hits in First Game,” August 14, 1939. Daniel, Dan, “World Series Film Saddens Yankees,” December 1, 1948. “Denies Censoring Movie.” Day illegible, but it is from November 1949. Feller, Bob with Bill Gilbert, Now Pitching: Bob Feller. (New York: Birch Lane Press, 1990). Letter dated April 26, 1990 from Phil Masi’s wife, Lucille, after Masi’s death. Letters from Ernie Rossi and Richard S. Williamson in the Chicago Sun-Times, April 15, 1990. “Masi,” obituary in Chicago Tribune, March 30, 1990. “Masi Clouts Homer,” April 21, 1944. “Masi Uncertain About Lou’s Tag,” October 7, 1948. McCoy, Bob, “Final Call: ‘I Was Out.’” The Sporting News, April 16, 1990. “Movie Pickoff Proves Naught,” November 10, 1949. “No Dissension Ever Says Southworth,” April 13, 1949. “Phil Masi, at 74, was catcher with Boston Braves from 1939-49,” Boston Globe, March 31, 1990. “Phil Masi,” obituary in Daily Herald, March 30, 1990. “Phil Masi.” No publication or date given. “Philip Samuel (Phil) Masi.” No publication or date given. Program from Funeral Mass at St. Cecilia Church, Mt. Prospect, Illinois, March 31, 1990. Rumill, Ed, “Phil Masi Arrives,” June 1947. Untitled articles: September 11, 1941; July 2, 1942; February 11, 1947. Also one titled “The Backstop Department” without a publication or title. There is also what appears to be a birth certificate. “White Sox Buy 2 NL Players,” February 2, 1950. Williams, Joe, “Series Movies Accent Mystery of Missing Play,” December 1, 1948.